Canine osteoarthritis is the number one cause of chronic pain in dogs. It affects one in five adult dogs and accounts for approximately 90% of arthritis treated by veterinarians. Conventional dog arthritis treatment usually involves the use of NSAIDs and other pain medications to control the pain caused by arthritis. However, many such medications have adverse side effects on dogs. Also, the pain medicines do not promote joint health or slow down further deterioration of the joints. In addition to the above, specific care for arthritic dogs should be provided, such as diet, exercise, and weight control. Please access this page which addresses the specific care mentioned above. 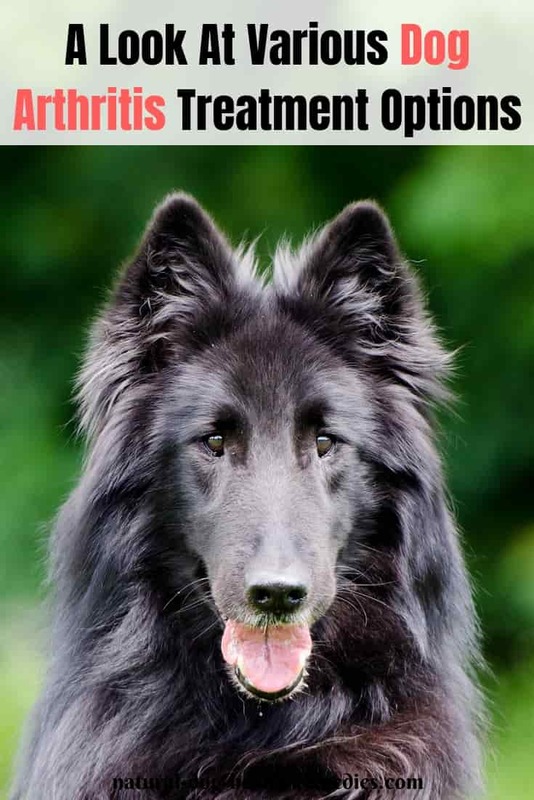 It also gives information on common types of dog arthritis and arthritis symptoms. Herbs that have anti-inflammatory properties can be used to help reduce inflammation caused by arthritis. Some such useful herbs include guggul (an Ayurveda herb with powerful anti-inflammatory properties), boswellia, alfalfa, tumeric, hawthorn, licorice, yucca, nettle, parsley, and garlic. Omega-3 Fatty Acids: Two components of Omega-3 fatty acids, EPA and DHA, have been found to reduce inflammation as well as pain associated with osteoarthritis. Fish oil such as salmon oil is rich in Omega-3 FAs. When supplementing fish oil to dogs, be sure to also supplement vitamin E, otherwise the body will be depleted of this vitamin. Vitamin C: Vitamin C is an antioxidant, has anti-inflammatory properties, and maintains the health of collagen. It is therefore beneficial to dogs with arthritis. Bromelain: This is an enzyme found in pineapples, and has strong anti-inflammatory properties. It works best if given at least one hour before or two hours after meals. Quercetin (a flavonoid) can increase the efficacy of bromelain, so it is best to use a product containing both bromelain and quercetin. Green-Lipped Mussels (GLM): GLM has been shown to contain anti-inflammatory components and other nutrients that enhance joint health. Clinical studies have found that sprinkling GLM powder on dog food was effective in reducing arthritic symptoms. Hyaluronic acid (HA): HA is a normal constituent of joint fluid that makes the fluid thick and provides joint lubrication. HA has been found to be able to reduce swelling at the site by decreasing white blood cell migration and infiltration into the affected tissue. It also has the ability to reduce pain and inflammation. Many vets now recommend supplementing arthritic dogs with HA as part of the treatment for osteoarthritis. Two available products of HA are Cholodin Flex and Cologel. Both are made by MVP Laboratories. Cholodin Flex is a chewable treat that contains HA. It also contains choline to decrease the risk of canine cognitive dysfunction. Chologel is a potent gel form for animals that do not like the Cholodin Flex treat or that have more severe arthritis. There are quite a few herbs that can relieve joint pain in dogs, such as cayenne, feverfew, skullcap, St.-John's wort, and ginger. Please visit our page on Herbal Pain Remedies for Dogs for more information. Sometimes, arthritis is caused by accumulation of free radicals in the body. As a dog ages, more and more free radicals will be accumulated in his body. Some culinary herbs, such as oregano, thyme, basil, ginger, as well as turmeric are natural antioxidants and can be added to your pet's daily diet to remove the toxic free radicals. These herbs should be considered and included as part of the dog arthritis treatment. Green tea is another herb that has been found to be excellent in removing toxic substances. The herb milk thistle is also known for its ability in assisting the body in combating environmental pollutants and supports healthy liver function. Vitamins A, C, and E; Omega-3 fatty acids (fish oil, and flaxseed oil) are excellent natural antioxidants that can help eliminate free radicals from the body. This product contains a lot of helpful herbs, such as milk thistle, green tea, and turmeric, and can effectively remove toxic substances from the dog's body. More and more dog parents are turning to natural supplements such as glucosamine, chondroitin, and MSM for maintenance of dog joint health and prevention of dog arthritis. For more information on these supplements, see our pages on Glucosamine sulfate and chondroitin sulfate and MSM for dogs. Since most dogs having arthritis are older dogs, when considering supplementing any of the above to help an arthritic old dog, please remember one thing: older dogs tend to have impaired organ functions (e.g. impaired liver or kidney functions). Therefore, before starting your dog (especially if s/he is a senior dog) on any supplements, a complete physical checkup including complete blood works and urinalysis should be done. Also, consult with your vet to see if there are any potential contraindications and drug interactions if your dog is already on medication. In addition, many commercial dog diets for senior dogs already have some joint supplements incorporated into the formula, so additional supplementation may require dosing adjustments. Again, talk to your vet to ensure you are giving your dog the appropriate dosage. Many dog owners have tried homeopathic treatments for their dogs' arthritis with good results. There are quite a few homeopathic remedies for dog arthritis depending on the particular symptoms. Consult a holistic vet for the one treatment that is best indicated for your dog's condition. 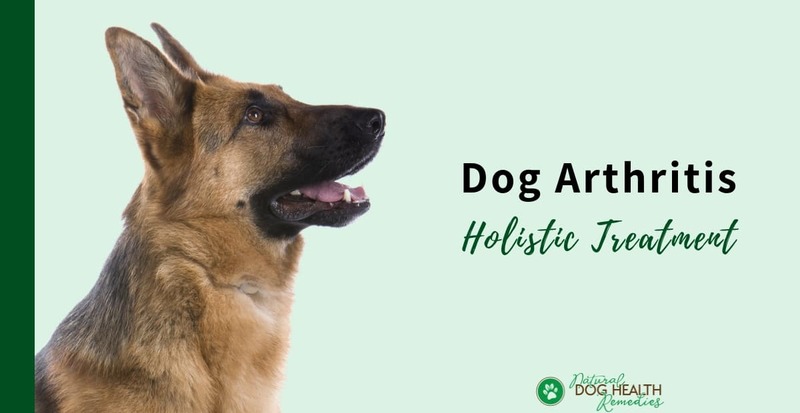 This remedy is for dogs with chronic arthritis, pain, and stiffness which gets especially obvious after a long period of rest such as getting up in the morning. This remedy is effective for hip dysplasia, joint arthritis, and spondylitis (arthritis of the spine). It is most suited for dogs whose arthritis symptoms (stiffness and pain) are getting worse as they age. This homeopathic remedy is indicated for dogs whose arthritis condition has come on suddenly and rapidly. The dog is irritable because of the severe pain, which is accompanied by a fever (average normal dog body temperature is 101°F or 38°C). Some dog owners have reported good results from the use of a commercial homeopathic anti-inflammation product called Traumeel (T-Relief). It uses such effective anti-inflammatory homeopathic botanicals as Arnica, Belladonna, Aconitum, Calendula, etc. and comes in ointment and tablet forms. Acupuncture is a non-drug complementary treatment option that you may want to consider if your dog has arthritis. Aromatherapy can also be incorporated as a part of the dog arthritis treatment. It can be used to relieve joint pain caused by arthritis and hip dysplasia in dogs. Prolotherapy involves the injection of sterile nutrient solutions or platelet-rich plasma (PRP) directly into weakened connective tissues such as joints, tendons and ligaments. This injection promotes increased collagen formation by stimulating local stem cell growth. The stem cells then differentiate into the cells necessary for repairing the injury or degenerative condition. Platelet-rich plasma (PRP) is prepared by drawing a small quantity of blood from the dog patient. The blood is then placed in a special processing centrifuge that separates platelets, white blood cells (WBC) and serum from red blood cells. The platelets and WBCs are then concentrated and collected into a sterile syringe. Some of the blood is used to create an "activator" of the PRP. The concentrated mixture of platelets and WBCs are then injected into the injured site. The procedure requires that the dog be sedated and the typical hospital stay is half a day. The injections can be placed into multiple locations at one session, and usually a series of three to five sessions, two to four weeks apart, is required. The result of prolotherapy is stronger and healthier bonds in the connective tissue with each treatment, until the healing is complete and the pain gone. If your dog is starting to show signs of osteoarthritis (or has been diagnosed with mild form of hip dysplasia, elbow dysplasia, Wobbler's syndrome, or anterior cruciate injury), ask your vet about prolotherapy, or ask him/her to recommend a vet trained in prolotherapy to take a look at your dog to see if the dog is a suitable candidate for this therapy. Low level laser therapy has been found to be effective in helping canine arthritis. Laser therapy can increase cellular energy, reduce swelling, relieve pain and inflammation, and relax muscles. If your dog is suffering from arthritis, ask your vet about these therapies and see if it is viable to have one or more such therapies incorporated in your dog's arthritis treatment protocol. This therapy involves the use of underwater treadmill and swimming. K. Schulz, DVM, The Pet Lover's Guide to Canine Arthritis & Joint Problems (Saunders Elsevier, 2006).